It will not be remembered for it's number of migrants, but Spring 2008 must go down as one of the most varied in 11 years recording here. In year listing terms, this has to be one of the best, producing an assortment of rare and scarce migrants. But once again, visible migration was extremely poor, with very few notable totals. The number of Wintering thrushes remained very low and there were to be none of the typical build-ups of large numbers of Fieldfare. The best Fieldfare count, turned out to be 53 moving north-east on March 24th. Otherwise, all other species produced only meagre totals although 124 Starling east on 26th was more notable. The only exception was Meadow Pipit, which produced their best Spring count since 2001 when 244 flew north-west on March 27th. Although much of the sky was completely devoid of any notable visible migration for much of the time, there were still some occasional highlights. An unexpected record concerned two Hawfinch that flew north towards Lound Wood on April 6th, which was the first since August 1999 and only the second ever Hawfinch record. Three Tree Pipit in a Spring here is unheard of, so it was pleasing that singles were noted on three April dates (17th, 19th and 23rd) whilst three Common Crossbill flew north over Eakring Flash on the afternoon of March 26th. Another rarity of recent years has been Corn Bunting, so it was especially pleasing when one flew east over Eakring Flash (the first for five years) on a very productive April 27th morning - a morning which also produced the only Whinchat of the Spring. The first Wheatear of the Spring, was a male briefly at Eakring Field Farm on March 30th and there were additional April records involving single males at Park Farm (2nd) Tug Bridge Farm (14th) and in fields at Kersall (17th) Four Wheatears arrived at two sites on 10th, with three males in fields at Park Farm and a female at Red Hill. Male Redstarts were at Eakring Flash on April 10th and 27th. 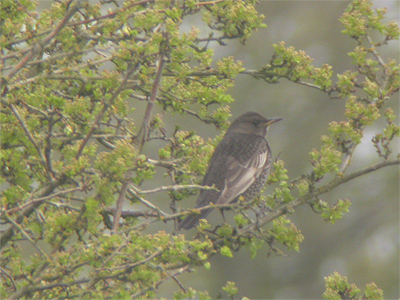 A group of 12 Fieldfare at Penny Pasture Common also held a female Ring Ouzel which remained from April 19-23rd. This bird could be very difficult to locate at times, spending much of it's time feeding on Ivy berries (something at least two other Ring Ouzels have done here in the past) but did show quite well occasionally on a few mornings. A new species for the area came when a Nightjar flew over Lound Wood and headed south-west at 23:15h on May 20th. Perhaps the bird of the period was the Hen Harrier seen quartering fields in the Red Hill area for around five minutes, before eventually drifting west and out of view on April 27th. This was almost certainly the bird which had been recorded at Bolsover, then Carburton, before being seen at Eakring and then a day or so later was seen flying over Mansfield Woodhouse. Hen Harrier continues to be one of the rarest raptors here with only four records since 1999, but now seen twice in the last two years. April had opened with a Red Kite west over Lound Wood on 1st. Red Kite has now become virtually annual at Eakring and looks set to become even more common in the years ahead. Unfortunately, there was to be no Osprey (last Spring record here in 2005) or Marsh Harrier (2002) even though both have shown similar fortunes as the Red Kite. Migrant Common Buzzards were noted on three Spring dates, with five (all singles) coming over from the south-west and continuing north and north-east on March 14th, with the end of April also seeing some passage with a group of seven Common Buzzards high south-east (27th) followed a few days later by three more high south-east on 29th. There were records of four different Peregrines between February and April, whilst a Merlin moving west over Eakring Flash and Red Hill on March 29th, maintained the regularity of records in recent years. There were no records of Hobby. The one notable ornithological feature of the Spring was (without doubt) the record number of Stonechats which moved through the area during late February and most of March. 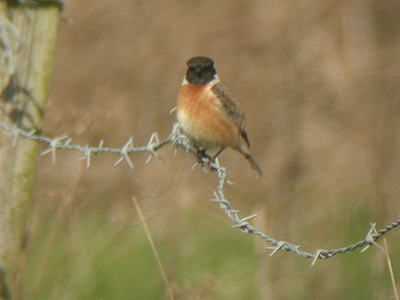 Stonechats had been noted arriving at some south-coast sites during the last week of February, but it was still a great surprise when three birds turned up at Eakring on the 28th, with a male along the roadside between Eakring and Wellow and a pair along the boundary fence at Penny Pasture Common. These were the first February records here since 2001. A further 16 Stonechats continued to appear throughout the whole of March, so when you consider that there had never been any more than three Stonechat in a single Spring here before, then the scale of this passage needs little imagination. Upper photograph: One of the many hibernans Stonechats (upper right) which moved through the area in late February and throughout most of March. 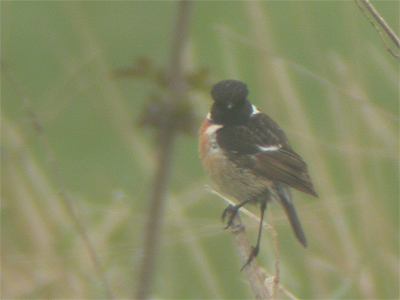 Lower photograph: Continental Stonechat (rubicola) which was at Eakring Flash on April 23rd. Penny Pasture Common provided eight of the month's Stonechat with five (four males and a female) present on March 4th, followed by another male on the 6th and then a male and female on the 19th. Two males were along roadside hedges near Eakring Field Farm on 29th, whilst roadside hedgerows near Wellow, also produced a female on the 14th and a male on the 17th. Records from Eakring Flash included two males (14th) and females on both 15th and 29th. However, the most interesting Stonechat did'nt turn up until the extremely late date of April 23rd and was almost certainly of the continental race rubicola. It was present at Eakring Flash from early morning and remained until dusk, initially favouring a grass track and rough vegetation near Eakring Flash, but then relocated to the north-eastern corner of Eakring Flash, where it remained for the rest of the day. Stonechat had never before produced an April record here, with late Winter and early Spring records all falling between inclusive dates of February 21-March 29th. The occurrence of this bird came over three weeks later than all previous records. There were no records of Cuckoo or (as mentioned earlier) Hobby this Spring. Spotted Flycatchers were not recorded moving through the area, but a pair was discovered feeding young at Eakring during June, having presumably arrived at the end of May. Redstart and Tree Pipit were the only two species to produce new earliest arrival dates, with both beating their previous earliest dates by a day. March arrivals included Sand Martin over Hare Hill Wood and two Chiffchaffs in Eakring village on 27th. April arrivals included Swallow 4th, Blackcap 7th, Willow Warbler 10th, Yellow Wagtail 17th, Grasshopper Warbler, Whitethroat, House Martin and Turtle Dove 21st, Lesser Whitethroat 22nd, Sedge Warbler 24th, Swift 27th and Garden Warbler 30th. In all, a fairly disappointing migration season at Eakring, despite there being a selection of raptors, the first record of Raven for the area and the best Green Sandpiper passage for several years. A total of nine Tree Pipit moved through between August 14th and September 4th, peaking with three over on August 21st. This was the best Autumn Tree Pipit passage at Eakring since back in 2003. Meadow Pipit also produced the best count since 2003, with a combined total of 1 874 birds. Although a healthy total, daily passage remained restricted, with highest counts of 335 south (September 18th) and 212 south a few days later on September 21st. Swallows peaked slightly earlier than Meadow Pipits, with a total of 398 through on September 14th. Chaffinches again provided some record site counts for the third year in succession. Three figure counts occurred with 120 west on October 18th and 119 west on October 30th, part of an October total of 526. It is quite interesting to see how Chaffinch numbers have shown some changes in arrivals over the past 11 years, now producing distinctive peaks in movements during October, with relatively few moving birds in September and November. In 2000, movement continued from September-November, with each month producing a similar total. The past few years have also seen much higher numbers of Chaffinches moving west, rather than what used to be more typical southerly bias, but in 2007 and 2008, good numbers at Eakring in October, both followed very large numbers noted moving at East coast sites and on the near Continent. Most other common finches were yet again only noted in low numbers daily. Linnet failed to produce any notable daily count, yet used to be one of the most prolific movers in the late 1990's and early 2000's, when total counts were well in excess of 1 000 on three occasions and daily three figure counts were commonplace. A Twite moving east over Eakring Flash on November 15th, was the first here since 2001. Two species which did produce record numbers this year were Siskin and Common Crossbill. Siskin passage began slightly early this year, but passage was strong with a September total of 178, beating all previous record counts. Movement was recorded virtually daily, with the largest total being 59 through on September 14th. 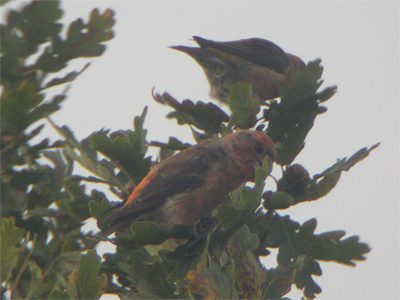 Common Crossbill produced several records (unusually for Eakring) beginning with two flying north-west over Eakring Flash on July 26th, followed by a singles on August 24th and September 6th, then seven moving north over Eakring Flash October 5th and finally four moving south over Eakring Flash October 16th. September also provided another large influx of Honey Buzzards into the eastern areas of the UK. At Eakring, return afternoon visits to the area proved successful with an adult south over Red Hill on 21st, followed by a dark-phase juvenile high north-east over Eakring Flash at the end of the influx on 28th. Scanning for raptors in the Red Hill area, also provided a distant wing-tagged Red Kite on 13th and the area's long-awaited first record of Raven, when two flew south on 20th. A juvenile Goshawk was at Eakring Meadows/Parkhill Plantation on September 1st, whilst September and the rest of the Autumn produced a total of nine Hobby and three Peregrine through. 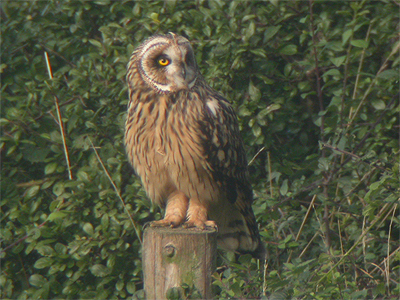 A Short-eared Owl was at Penny Pasture Common, Eakring Meadows from September 13-14th. An early arriving Jack Snipe was at Eakring Meadows from October 9-18th, with three there in November, probably being representative of a good Jack Snipe Winter. Common Snipe numbers were fairly low for the whole of the Autumn period, with only a few singles being noted on visible migration watches. The only Whimbrel went west over a foggy Eakring Flash on July 24th, but there was the best passage of Green Sandpipers here for several years. Common Sandpipers were at Eakring Flash on July 26th and nocturnal passage was evident, with one heard calling over Red Hill after dark on August 12th.